Home :: Crafts :: Feathers, Feather Cone :: Pheasant Pad Feather - 1-1.72" - 7.5"
Pheasant Pad Feather - 1-1.72" - 7.5"
This item is not only an ornament, you can cut off one or more feathers to make earrings, feather hat, hair accessories etc.. Size of feather: 1 to 1.72 inches long. Length of feather trim: approximately 7.5 inches. 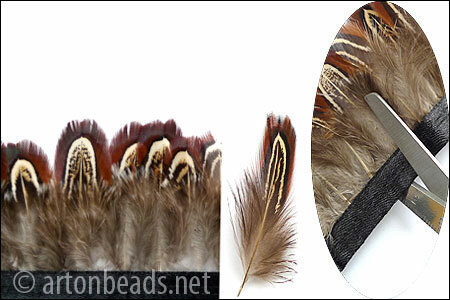 Notify me of updates to Pheasant Pad Feather - 1-1.72" - 7.5"